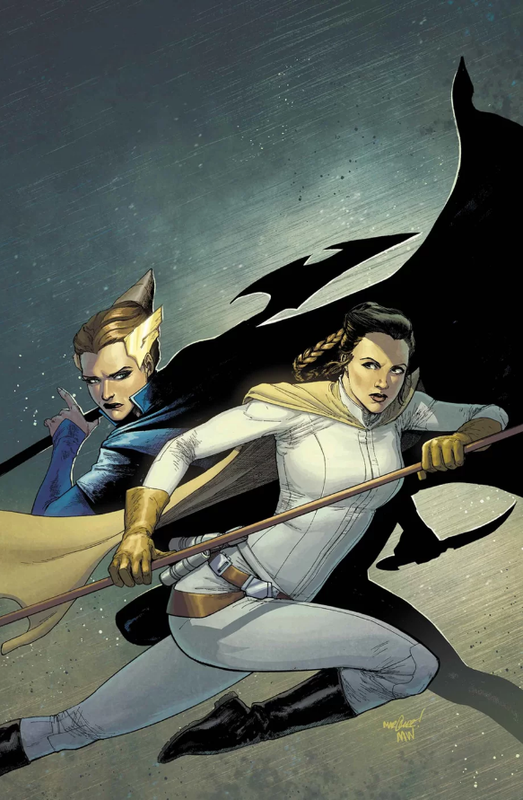 Star Wars #43 wraps up The Ashes of Jedha story arc with a few twists and surprises to make it an enjoyable read. It’s not perfect, but it gets the job done, and moves the characters on to a new adventure and scenery. It’s also probably a good bye to Jedha. The issue opens, interestingly enough, with a mistake. I’m not sure whose’s responsibility is the word bubbles, but someone pointed the first world bubble to the wrong characters, which was confusing. Combined with Larroca’s art which melds photo realistic faces with traditional comic art, and it’s a jarring start for the issue. Yet the story did manage to move on despite those difficulties and I was able to get lost enough into the story to enjoy it. It doesn’t take long for the twist to reveal itself, either. Queen Trios reveals that she’s really helping the Rebels, which certainly plays into their favor. Elsewhere, Luke battles the crazy Imperial officer who brandishes a flamethrower and a battle ax. Rather than out fighting him, Luke out smarts him. Completing the story, Han deals with suicidal Ubin by coming up with a plan that saves everyone. Thus the Rebels win again. While the story isn’t groundbreaking, it’s still enjoyable. Larroca’s artwork has its plus and minuses, and overall, it’s not a bad issue. I give it a four out of five metal bikinis.